Low and behold, Johnny Manziel has the number one selling NFL jersey as of July 17th on the NFL official shop. Not bad for a rookie who has yet to throw even a preseason pass in the pros. It is always interesting to see which players that fans are willing to spend their hard earned money to emulate. Be sure to check out the top 25 top selling jerseys at the end of the post. Before this last official count by the NFL, Russell Wilson had the #1 selling jersey. The Seahawks QB got a big bump in sales around the Super Bowl but was at #3 at the end of 2013 already. It will be interesting to see where Manziel is on the list come the end of 2014. I do not see his team having near the season that Wilson and the Hawks had. So I envision his #1 spot not lasting all year. 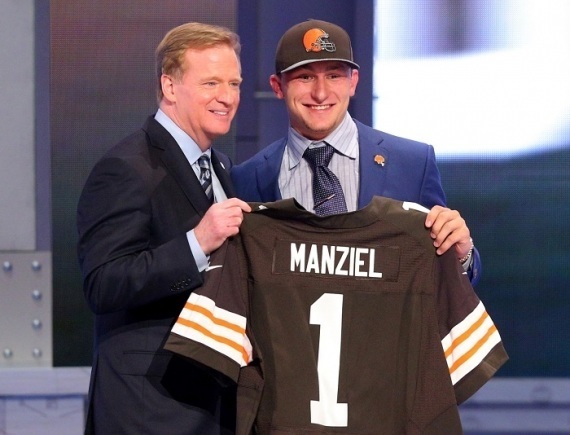 In case you think Johnny Football is seeing millions from his jersey sales, you are mistaken. The overall sales are divided up equally among all players in the league. So the guy with the fewest jersey sales will see the same revenue as the top seller. If you think that is unfair, I would agree. However, at least pro players get some revenue from the sales. How would you like to be a college football player and receive zero dollars for your jersey sales? There is no telling how many Tim Tebow or Cam Newton jerseys were sold when they were wowing the country as college ballers. They got zilch! The dollar amount of official NFL jersey sales is in the millions obviously. But add on to that, all the fake jersey sales that end up on ebay and flea markets. I even got in on the action a few years ago, buying up Mike Vick jerseys at a legit Reebok outlet and selling the hot item on ebay at double the price. Jerseys are a big business, and they are just a segment of overall NFL merchandise sales. On most city streets you can count the NFL as a major clothing supplier just like American Eagle or Abercrombie. NFL gear is simply everywhere you look. There are some interesting notes from the latest sales list. Tom Brady refuses to drop out of the top ten, even after a long career. He is the Ric Flair of jersey sales, as he just keeps on going and going. Richard Sherman talked his way into the top five, even though his play on the field was already worthy. Michael Sam may not even make the final cut in St. Louis but there he sits at #6. The #10 spot is not even occupied by a real player. Seattle fans really think a lot of themselves, do they not. I would think Jadeveon Clowney would be a few notches higher with all his pre-draft hype. And why is Megatron so low on the list?